And that is that, the end of another major, the end of three Open Championships is as many weeks on British links. Some things change, some things stays the same. Inbee Park is a major champion once more. Goodbye. Just as a reminder, Inbee Park, the world number one, has now won six of the last 14 majors. With a total of seven to her name, she is chasing Annika Sorenstam's modern-day record of 10. 2015 Women's British Open winner Inbee Park: "It feels great, this is something I have been dreaming of all my life. I finally reached my goal. It's just a relief. I'm so happy with everything. "I didn't feel that confident before this week, but to overcome a lot of things to win this championship is phenomenal. "When I play majors and see myself on the leaderboard it gives me a lot of confidence. Holding another major trophy is a confidence boost and is a big key to my success. "Ko Jin-young is a very talented girl and I didn't know I would be able to win on 12 under. All four days she has been fantastic. I know her well, I even had dinner with her this week. The golfing gods was on my side. "I can't really say what the next goal is because this is the one I set for my career. There are a lot of legendary players I should look up to. For now I should relax and enjoy this moment." Here come the pipers, a 20-piece band, blowing the bags in the wind, saluting Inbee Park. We are all done at Turnberry. 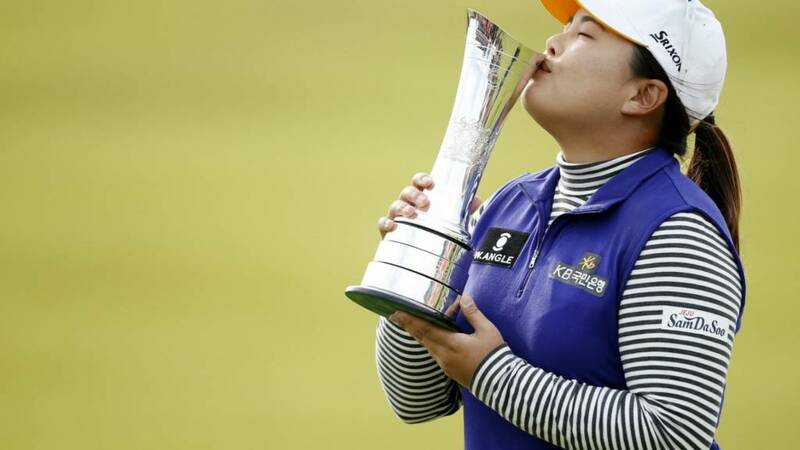 World number one Inbee Park has won the Women's British Open for the first time. A seventh major sealed with a splendid round of 65. Mid-way through the back nine, it looked like she would be locked in battle with Ko Jin-young. In the end, it was a comfortable three-shot win. The better part of 80 feet for Ko Jin-young. Two strokes and she's second on her own. A huge Saltire flutters heartily over the 18th green. The players are announced. We're a couple of putts away from officially anointing Inbee Park as champion. On the point of South Korean dominance, there are 38 Korean players in the world's top 100 and 154 in the top 500. Does any other nation rule a sport more than this? Last rites time. Ko Jin-young just about creeps on to the putting surface. The pin is in a different post code. Teresa Lu, a tie-dye outfit giving her the prize for the best trousers of the day, is on there too. Suzann Pettersen in for a 72. The two-time major winner finishes on seven under and has to settle for fifth place. Ko Jin-young is off down the last. She needs a par to seal outright second spot. Inbee Park is already getting congratulatory hugs from her nearest and dearest. Just on the subject of the top four players in the championship being born in South Korea, there are five Korean players in the world's top 10, plus Lydia Ko, who plays for New Zealand but was born in Seoul. A monster for Ko Jin-young on 17 for birdie. Will it? It might you know... just short. A par it is. Inbee Park is home and hosed. So Yeon Ryu and Lydia Ko share third place on eight under. All the top four players in this championship were born in South Korea. New Zealand's Lydia Ko, who shot a 69 and finished eight under: "Whenever I went in the bunker this week I didn't have much of a stance and when that happens you don't know how to think. I have been putting well all week. You just have to think positively. My score could have been better but I would say that any time. "This is my best finish at the British Open and it is one of the toughest majors. I am superb proud of my finish. I don't know if I will have a major win. It doesn't have to be now. I just need to try my best." England's Melissa Reid, who finished on -4: "It was awesome. We've had great groups and it's nice to see where my game is at. It's nice to contend in a major." Ko Jin-young, stripy jumper, red cap, gives her second to the 17th all she has, but still has work to do before she gets on the putting surface. Her race is run. "The fairytale that Ko Jin-young was living did not last. She must concentrate to make sure that she does not lose second place." Meanwhile, back at the 17th, any hope Ko Jin-young had of doing something extraordinary is hampered by a very weak tee shot. The world number one takes the applause, waves to the crowd, then heads off to the scorer's hut. Her 65 is the joint-lowest round of the week. Barring a small miracle, Inbee Park will be the champion. No birdie on 18, just lipping out, but a final round 65 looks set to seal a career Grand Slam. Right then, Inbee Park. Can you seal the Women's British Open? After all that, Ko Jin-young had the best part of 15 feet for bogey. Curving away to the right, she eventually takes a double bogey six. She is three shots behind Inbee Park and will almost certainly have to settle for second. That'll do. Maybe 20 feet, right of the hole. Get that done in two and Inbee Park is almost guaranteed to be the Women's British Open champion. Ko is looking for some flat ground for a drop. For the first time her smile has gone. She might just want it done now. On 18, Park has the perfect position for her final approach. ...she doesn't like it. The club is dropped, the ball rolls off the edge of the green and into the stream. The splash could well end her title charge. Head drops to the ground, face etched with despondency. Tell the engraver it'll be Inbee Park. Ko doesn't even bother to put her pink coat on. I wonder if Inbee Park holes this birdie chance on 17, would that be the ball game? Ko would be two back with only three to play. Nice from Inbee Park, lobbing on to the 17th green, chance of birdie, more likely to be par unless she pulls out something very good. Ko Jin-young has found the fairway on the 16th. Business end. The long birdie putt on 15 slides by for Ko Jin-young. Tidied up, jacket back on. Three to play. Can she find the shot to catch Inbee Park, or is she relying on an error from her compatriot? A slight error from Park, tugging her second at the par-five 17th. Rough, but a decent lie. Park has won five of the last 13 majors. That's just silly. Ko Jin-young is back in her pink parker jacket. I have to say I'm a fan of it. There's not enough fake fur in top level sport. The sturdy figure of Inbee Park, white trousers and blue gillet, is already on the 17th tee. Safely on to the fairway. Ko Jin-young, back on the 15th, finds the green of the par-three. It's a long way for birdie, though. Is that the moment? The world number leads on her own for the first time in this championship. Four-footer on 16, rolling in on the left of the hole. She is one up with two to play, while Ko Jin-young is just starting to go backwards. The career Grand Slam beckons? "It really is a shoot-out between Inbee Park and Ko Jin-young now." There's still drops of rain in the air, the busy sea still lapping at the shore. Fans, rugged up, follow the last groups towards the closing holes. The front nine is pretty much deserted. Big birdie putt from Inbee Park coming up. Ko Jin-young has missed the birdie putt on 14, very fast and to the left of the hole. A par on 14, a hole that holds a real chance to gain ground. She puts her hand to her eyes and manages a rueful smile. You can't help but feel the momentum is now with Inbee Park. Ko Jin-young has a birdie chance of her own, but it's trickier than she should have liked on the par-five 14th. Stand by for changes at the top of the leaderboard. Oh, Inbee Park. This is an unstoppable march, an insatiable quest for that career Grand Slam. Her approach to the par four 16th is within no more than six feet of the pole. That'll be for birdie and the lead. Who are you backing? Inbee Park is hunting a seventh major, level on the leaderboard with Ko Jin-young, but two holes in front of her on the course. Ko must feel like she is being hunted by the biggest animal in the women's game. Not that she's showing it, a good approach to the par-four 14th unlucky to roll through the back. Inbee Park's lightning streak with the putter comes to an end, unable to drain a long birdie shot on 15. Little one for par. She's got three to play. Yep, Ko Jin-young sends it by and will have a tiddler for bogey. She puffs out her cheeks and, frankly, looks a little upset. This is not the time to crack. That's her first drop of the day. Levels, you devils, at 11 under. It's all changing right before our eyes. Ko Jin-young has the putter out from off the green on 13, has not given it nearly enough welly and is miles short. Long one for par. We could be level at the top very soon. Inbee Park! That is a monster eagle putt on the 14th, taking her to within one shot of the Ko Jin-young. The world number one is still in the hunt to complete the career Grand Slam. One hole behind her, Ko has missed the green. game on. Oooohhh, Lydia Ko. That could be all she wrote for the young Kiwi. A par putt at 15 goes past on the left of the hole, meaning she's five back. Ko Jin-young was actually in light rough on the 13th. There was an element of peril in her second shot, but she's OK, in decent position to get up and down in two. Inbee Park won't make it easy for her fellow Korean, she's on the green at the par-five 14th. Long one for eagle to come. Ko Jin-young, remember, has not dropped a shot all day, with an eagle and two birdies in her first 12 holes. She has found the fairway on 13. It's hers to lose, rather than someone else's to win. American Cristie Kerr, who finished on -1: "It was very, very challenging. I had trouble on the greens which is usually the strong point of my game. I'm happy to be done. "The Koreans are so talented, they practice 10 hours a day. There is no shortage of talent there." Thanks, Phil. While I've been away, Ko Jin-young has surged towards winning a major at the very first attempt. Can anyone stop her now? The leader stays at 12 under with a wayward putt at 12 that spurns the birdie chance but offers an easy par putt. The lead remains three. And with that I hand you back to Stephan Shemilt, who will see you through to the conclusion. "It might be too little, too late, but Lydia Ko is still there." Inbee Park won't give up the ghost. She salvages par at the 13th to stay nine under. Lydia Ko sinks one a birdie putt from 15 feet at 14 to move back to seven under. Ko Jin-young is bang on the money with nearly every shot. It is relentless. She plants her second shot at the 12th on to the green and about 10 feet from the hole. That'll be another birdie chance. "It is the chasing pack that are dropping shots here and there. The leader has played beautifully, holing some crucial putts." Inbee Park hasn't given up hope of a career grand slam just yet, but she has work to do. The world number one's second shot at the par-four 13th is just short of the green. Disappointing. Another birdie for Wales' Amy Bouden at 14 takes her to five under. She won't be threatening at the business end but she can still finish strong over this back nine. Lydia Ko is desperate now. She needs to pick up shots and fast after her double bogey. She has a lengthy birdie putt at 13 and criminally leaves it short. Only the brave and bold will be rewarded. Especially with Ko so strong. She has just parred 11 to stay at 12 under. "The 12th hole is causing a couple of difficulties. Lydia Ko dropped two shots, both Melissa Reid and Minjee Lee dropped one." Inbee Park sinks her par putt and remains three off the lead with six to play. A lovely chip to within four feet from Inbee Park at 12 gives her chance to salvage a par. She will take that considering her tee shot, but she needs more if she is to to keep up the pursuit of Ko. A shot dropped for Pettersen at 11. That is consecutive bogeys for the Norwegian and she is five off Ko, who looks like the only woman who actually wants to win this at the moment. "Inbee Park and Ko Jin-young share the same management company. Park is something of an idol for Ko, she has been mentoring her young countrywoman. It's quite ironic Ko stands between her and a seventh major." Inbee Park is through the back of the 12th green with her second shot from the rough. I wonder if she is starting to regret all the help and advice she has been dishing out to fellow South Korean Ko Jin-young of late? "Ko Jin-young looking very good indeed, so calm, so controlled. But there's still a few holes to go." Inbee Park gets a bit of luck as a drain cover gives her a free drop into much better lie. Still in he rough but nowhere near as bad. She needed that luck as well as Ko Jin-young is looking increasingly unstoppable. Another birdie at 10 takes her to 12 under and a three-shot lead over the world number one. Inbee Park is in bother at 12. She is deep in the rough after her tee shot. Ko confirms her double bogey on the same hole. The 18-year-old's hopes of becoming the youngest women's major winner in history are fading fast. "We're seeing the trials and tribulations of all the others, but the leader Ko Jin-young is fairly serene." Ko's chipped fifth shot at the par-four 12th leaves her a few feet from the pin. At the very least she is looking at a double bogey now, that will take her back to six under and five off the lead. Lydia Ko has a swine of a lie at 12. She is buried deep in the green-side bunker. She takes a big swing at it but fails to beat the lip, landing in an even worse position back in the sand. She'll have to take a step back up the fairway to go forward. This could see her challenge fade. She is eight under but she won't be staying that way. This is a big putt for Inbee Park. It is to save par on the 11th. She makes light work of the eight feet between ball and hole and sinks it to remain two off Ko. Leader Ko Jin-young saves par at nine with a putt from eight feet. More frustration for Pettersen with the putter as she leaves her effort 10 feet an inch shy of the target and bogeys the 10th. Back to eight under she goes. Wales' Amy Boulden was nicely placed at three under at the start of the round but so far she has only improved her score by one. She comes agonisingly close to a birdie at 12 but pushes her putt just an inch past from about 12 feet. Here comes the rain. The brollies are up and faces become increasingly gloomy amongst the brave souls in attendance at Turnberry. You really can't beat a British summer. "What a bonus that is, from all of 10 or 12 yards. It was travelling a bit too, but Inbee Park gobbled it up." World number one Inbee Park remains in the hunt. Even more so now that she's just sunk another lengthy putt to claim a fourth straight birdie. After 10 holes she is nine under, level with Pettersen and two off the lead. Suzann Pettersen for birdie at nine. It is a good 15 feet from the hole but she nails it. She is the first to break away from the chasing pack as she moves to nine under. This is shaping up very nicely. "Ko Jin-young does not go away, she keeps getting stronger. What a round she is putting together." Ko Jin-young is a machine. Her lead is now three after a birdie at eight courtesy of a lengthy putt. The pack are trying to claw their way back but she is sprinting away at the moment. "Those who have been watching from the beginning will have seen some brilliant stuff, some bad luck and misjudgements. They've all, more or less, kept within reach of one another. Can someone have a little burst and go ahead?" Lydia Ko at eight. eight feet to the hole. No worries. In it goes and she moves to eight under, two off the leader. Melissa Reid has picked up a single birdie so far but she has not been without other chances to thrust herself into the reckoning. Another goes begging at nine as her birdie putt from 10 feet misses. She remains five under. "This may be the first major championship won by someone wearing a fur-lined parker." Ko Jin-young plays a lovely second shot to the par-four eighth green, leaving the ball around 10 feet away from the hole. She'll have a chance for another birdie. Shot complete she retreats to the warmth of her fur-lined parka. It ain't warm out there. Over to you Suzann Pettersen. She has a monster putt on the eighth and does well to swing it from over 30 feet to within a couple. She is far from out of this yet. A tap in gives her par. Inbee Park makes it four-three-three to finish the front nine and go to eight under. The world number one is on the charge. "Ko Jin-young has three wins in Korea this year, but this is her first major. It's terrific stuff. It's a big test now, can she just keep playing golf?" Wow! Just as Suzann Pettersen pulls back level, Ko Jin-young reasserts herself with an eagle at seven courtesy of a cracking iron on to the dance floor from 230 yards and an even better long-range putt. She is 10 under, has a two-shot lead and is very much the woman to beat. Lydia Ko has a chance to join the leaders with a birdie putt at nine. It is about 10 feet from home. She takes her time and gives it plenty. Too much in fact and the lack of direction takes it past. She remains seven under. Mika Miyazato has holed her fair share of putts over the first three days. She have a lovely, simple action and finds the centre of the hole time after time. The lead is shared once again as Suzann Pettersen sinks her putt on the seventh for a birdie that takes her to eight under. This tournament remains in the balance. Maria McBride is not taking any chances, sporting a woolly bobble hat over the top of her cap. Sun and wind catered for. Not that there is much of the former about. Things going pretty well for her on the ninth, though, as a birdie takes her to four under. Pretty damn good considering she carded a seven-over 79 in her first round. Cheers Steph. You join me as leader Ko Jin-young makes her first mistake of the round, pushing a makeable birdie putt past the hole. She remains on top but the lead is still just one shot. Meanwhile, Lydia Ko is up to seven under after a birdie at eight. Our leaders are about a third of the way through this final round, someone is around two and a half hours away from being crowned the 2015 Women's British Open champion. Here's Phil Dawkes. "I thought Inbee Park was going to storm up the leaderboard after two early birdies but two bogeys have held her back. She is just a couple behind the leader now, though." Inbee Park's up-and-down round continues with a birdie on the seventh. That's her third of the day, two go with two bogeys. The world number one is back up to six under, two off the pace. Japan's Mika Miyazato is quietly going about her business, one shot dropped, one shot picked up. She remains on her overnight score of six under through six, two shots off the lead. "Suzann Pettersen has played a number of quality iron shots and has not had the results she deserves from them." Chinese Taipei's Teresa Lu shared the over night lead with Ko Jin-young, but dropped three shots in the first two holes. A five-foot birdie change goes begging on the fifth, before Ko holes out for par. The leader is wrapping herself up a pink jacket. Furry hood, East 17-style. Ko Jin-young is taking her time on the fifth green, circling her ball with suspicion. Just on the fringe, up then down, right to left. Just short, but good for a par. Mel Reid, pink top and baggy grey trousers, doesn't like her approach to the par-five seventh. She's dropped her club, in fact. I think she got as much of the ground as she did the ball. It's barely gone anywhere. Extraordinary. "Inbee Park is a very serene player. She never seems to do anything exciting and then you add it all up and she makes a 68. It is quite remarkable." Now then, Amy Boulden. The 22-year-old from Wales has birdied the par-five seventh, her third of the day, to go to four under, four off the lead. There's two bogeys in her round, too. Cut the errors and she might contend. Excellent flotilla of ducks bob up and down on the sea, carried along by the waves. They look as calm as Ko Jin-young. There's been lots of chat about slow play throughout this tournament, and, at the moment, it remains sedate. Settle in. Hmmm, more trouble for Inbee Park, another shot gone on the fifth. From seven under, she's slipped to five under in the blink of an eye. "Ko Jin-young looks very calm for a newcomer to the game. Very relaxed. Let's see how she is in a couple of hours." Leader Ko Jin-young is not only playing in her first major, but also her first links tournament and is even on her first trip to Scotland. In a stripy jumper, mainly of orange, and maroon trousers, she's steadily playing par golf at the moment and will look for more of the same with a short putt on the fourth. In it goes. Very calm. If Pettersen is to carry the European charge, she does so in the hunt for a third major. Dressed in a peach gillet and matching trainers, she's off down the fifth. "Pettersen's putting hasn't been great, especially yesterday. If she wants to win this Championship she needs to get her putting going." Hmmm, it already looks like this leaderboard will be hard to keep up with. Suzann Pettersen, joint-leader for a short while, has bogeyed the par-three fourth. She's back to seven under, leaving Ko Jin-young alone at eights. As the sea laps the shore, it's tricky on the coast. Ah, Melissa Reid! Our first sight of the British challenge today and it's a belter, draining a long one of the fifth for her first birdie of the day. Five under, three of the lead. Her playing partner Lydio Ko has holed that par putt to stay at six under. Eight players are within three of the lead. "The bird may have damaged that ball. If that is the case there'll be a quick change. No dramas." Hello, what's this? A ball just off the green, second cut. Is that a crow having a good peck at it? I think it belongs to American Katie Burnett, way down the list on five over. That won't help. Lydia Ko, the whizzkid world number two from New Zealand, is in a spot of bother on the fifth. All in black (obviously, for a Kiwi), she's gone through the back of the green and is some of the long stuff. Ah, that's nice. Bump into the fringe, leaving four feet for par. "Some of the leaders are struggling early on in the piece." Conditions at Turnberry are, well, atrocious. Windier than a scrum after beans on toast, the odd drop of rain too. Ooohhh, bad miss from Park on the par-three fourth, she's dropped back to six under. Already the sharks are circling for leader Ko, with world number one Inbee Park two under through three holes to move just one strike off the lead. As I write that, Norway's Suzann Pettersen holes on the third to go eight under and share top spot. If you'd like to watch pictures that accompany this entertaining and informative live text, then live BBC Two coverage is under way at the top of this page. #bbcgolf or text on 81111. Denmark's Nanna Koerstz Madesn, too far back to contend, has already taken Turnberry for a seven-under 65 - low scoring is very, very possible. With 17 players within eight shots of leader Ko Jin-young, expect changes on the leaderboard. Yep, around 18:00 this evening, the champion of the 2015 Women's British Open will be crowned. If the early exchanges of Sunday's final round are anything to go by, we're in for a cracker. Three weeks, three Open champions on the links courses of Britain. Who will be the third?